As the body grows older, it grows frailer and requires more care. Once simple obstacles can become major dangers. And all the extra care incurs more expenses for both those injured and their families. A 98-year-old woman was riding in a Miami-Date public transit bus when that bus was hit a car. The crash left four injured, including the 98-year-old woman. The crash happened in Hialeah, at East 4th Avenue and 25th Street. The older woman was transported via air rescue to Jackson Memorial Hospital as a precaution from her age and injuries. 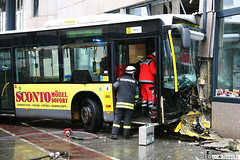 Others were hurt, including the driver of the car, but not so seriously. Now, we ask, what of the expenses this woman will have to pay because of the injuries and resulting hospitalization? She put her trust in the public transit system, and yet her life was threatened. Car accidents often leave us in a tough situation, with personal trauma and expenses that we can’t pay. Most people don’t have the kind of money to handle these bills and often trust in their insurance companies for help. But, all too often, the insurance money isn’t enough. Then what? Having the right legal representation can make all the difference. An experienced lawyer can make sure you get all the help you need to recover and that your rights are not ignored by other parties. Miami Car Accident Lawyers are ready and willing to help you. They can work with your insurance company for you and make handle all parties involved to ensure that you get the help and support that you both need and deserve. Call Miami Car Accident Lawyers now from more information and a free consultation.